Anyone who knows Elaine Equi's work will not be surprised by the breadth of subject matter this "expansive minimalist" presents in this volume. 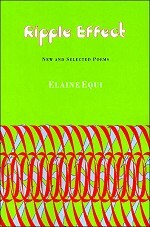 Her poems are, after all, Zen koans for our time, and Equi covers it all, from "the Grecian urn/to Grecian formula 44" ("Voice Over"). Equi's work is where pop truly gets culture, understands it, loves it, buys it a drink, and takes it home at night. But reading this retrospective with its framing sections of new and old work, I nonetheless am still surprised and delighted by these poems, and their sly, wry, and fundamentally kind point of view. The book begins with her new work, jumps to selections from her first Coffee House publication Surface Tension, moves through work from Decoy, Voice Over, The Cloud of Unknowable Things, and then rounds back to early work from books such as the landmark Federal Woman. It is a curving motion through repeated themes and forms which works well, showing the growth of the body of work and then its roots. but the reverse is also true. Can You Recognize This Famous Poem? or good exercise to cleanse the palate. "the visual poverty of letters"
you must learn to make the best of it." —""You Go to My Head"
A: The earth has always supported me in all my endeavors. I trust it. So the reader of Ripple Effect, guided by the poet through imagination, improvisation, and the avant, also trusts enough to willingly follow Equi's edgy lead. Larissa Shmailo is a poet and a translator. Her poetry CD The No-Net World may be heard at http://www. myspace.com/thenonetworld. She recently contributed translations to the anthology Contemporary Russian Poetry forthcoming from Dalkey Archive Press.